Front Range Theatre Company * - News! 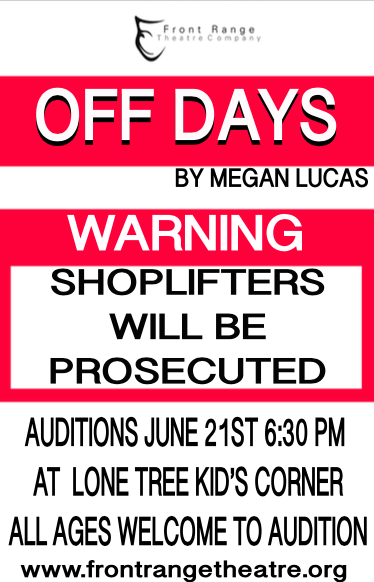 Off Days By: Megan Lucas will be produced on August 11th and 12th at The Lone Tree Library! We are inviting all those interested, to audition this Wednesday at The Lone Tree Library. We will hold these auditions at The Kids Corner. Please bring a headshot/resume and prepare a 1 min. comedic monologue. We decided to update our website! Please explore the new design and get familiar with it. Everything should be easier to find and neatly organized. We are also going to start using this page, NEWS, to keep you updated on everything happening at FRTC. This goes beyond our social media accounts and we wanted this site to feel more personal. We wanted our guests to enjoy the experience, see how Front Range operates, and get to know the staff. In addition to that, we have put up all of our previous seasons with posters, photos, staff at that time, and programs. To check out our awesome staff, visit the STAFF PAGE.